Over at The Moment Blog – NYTimes.com is a number of articles on men’s shoes that should be helpful to any man looking to pick up something new. This article, Fancy Footwork | Designer’s Men’s Shoe Collaborations, features these numbers from Florsheim that not only have some great models in black, brown and tan, but they slip in a blue number, too. They also have a good write up on low cost Zig Zag shoes (like these below) that are perfect for summer. I’ve already found a place I want to stay in Paris in the “save” section: it’s Mama Shelter Philppe Starck had a hand in it, it’s in Paris, and the price is right, so I have to go! What’s great about blogging is that someone, like the writer of the blog Ecocomics, can take what appears to be two very different interests (economics and comic books) and put them together to come up with something very different and interesting. For example, where else would you find someone posing the question: Where Does the Canadian Government Get the Money from to Keep Making Super-Soldiers?, other than at Ecocomics? If ecocomics had come out sooner, we’d have alot more people interested in economics! Go see. Roo Reynolds now works for the BBC. He used to work for IBM, where I got to know of him. He has a gift for social media, and anyone who wants ways to use it more effectively should consider following Roo. One of the things he does well, among many, is write about which books he is reading. He takes a photo and then talks about them. It’s simple, but it works well, I think. 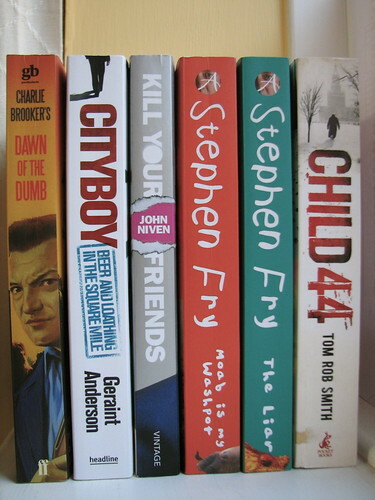 Here’s a recent selection of works he is reading, including some books by Stephen Fry (always a good choice).